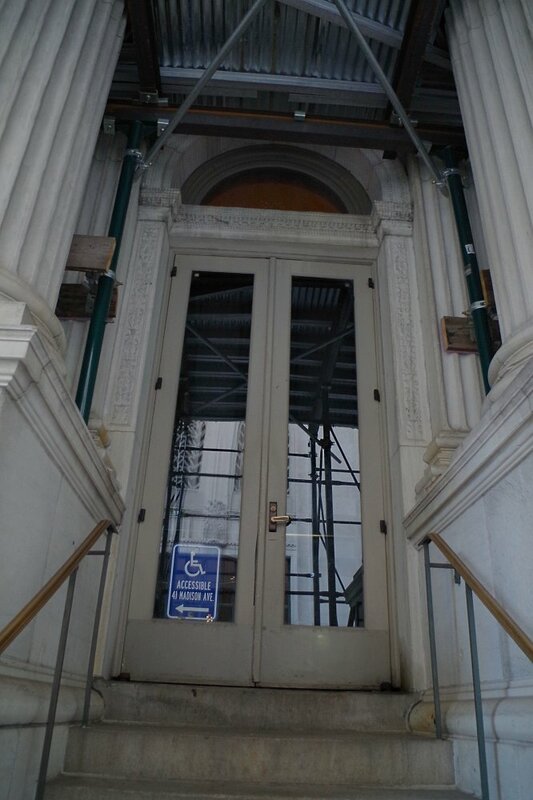 Description: The building faces south and is a three story limestone structure. 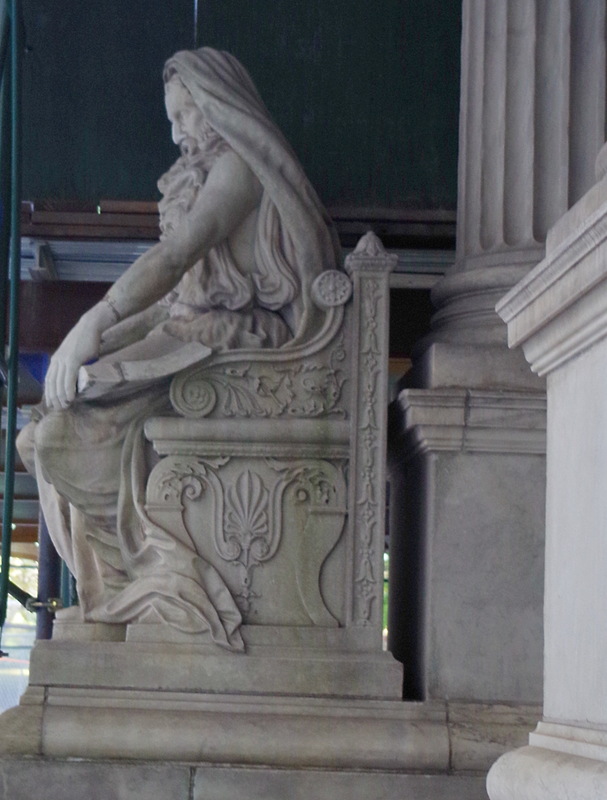 The exterior features scultures in white colored marble related to the law, Kart Bitter’s Peace is the central grouping on the ballustradw by Madison Square. Daniels Chester Freench’s Justice is the central grouping on 25th Street. Justice is flanked by Power and Study, also by French. 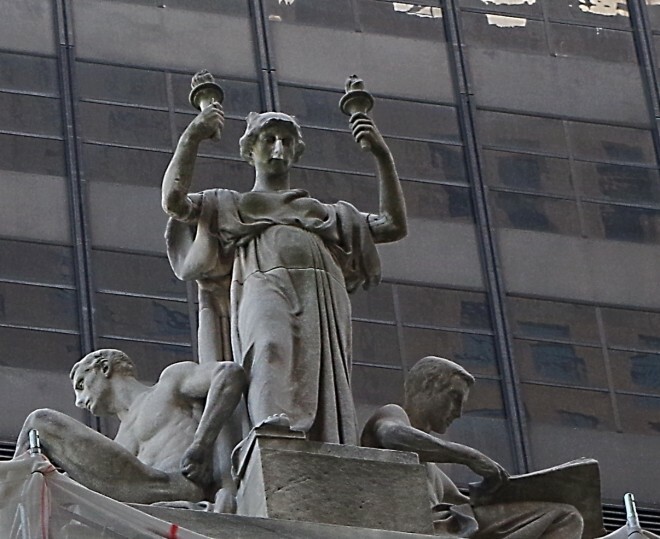 Charlees Henry Niehaus’s Triumph of Law, described as a “giant pedimental group” on “a screen of six Corinthian columns, rising from several groups of allegorical sculpture,” fronts 25th Street. Thomas Shields Clarke sculpted screen of female caryalids on the Madison Avenue front, at the third-floor level, representing the seasons; Summer holds a sickle and a sheaf of wheat. On the roof, there are single standing figure sculptures, depicting historical, religious, and legendary lawgivers. These statues are of the same height and proportion, are robed, and appear with various attributes associated with the law, such as book, scroll, tablet, sword, charter, or scepter.. The first statue on the Madison Avenue side is Confuciu by Philip Martiny, with Peace by Karl Bitter in the middle, and Moses by William Couper at the other end. Facing south on the 25th Street side is Edward Clark Potter’s Zoroaster, which was along with all 25th Street statues moved down one bay when Charles Albert Lopez’s Mohammed was removed in 1955, following protests against this image of the prophet from Muslim nations. Next on this side is Johnathan Scott Hartley’s, Alfred the Great, followed by George Edwin Bissell’s, Lycurgus and Herbert Adam’s, Solon. Next to Solon is the Justice set of sculptures by French (described above), and then three more statues: John Talbott Donoghue’s, Saint Louis, Henry Augustus Lukeman’s. Manu, and Henry Kirke Bush-Brown’s. 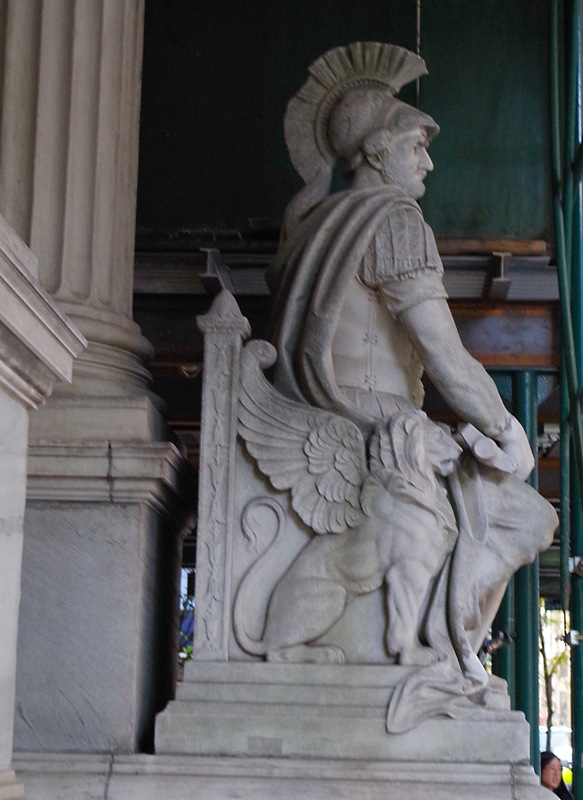 Justinian.. At street level, “two pedestals holding two monumental seated figures” of Wisdom and Strength by Frederick Ruckshull ( born Ruckstuhl ) flank stairs leading to a portico. 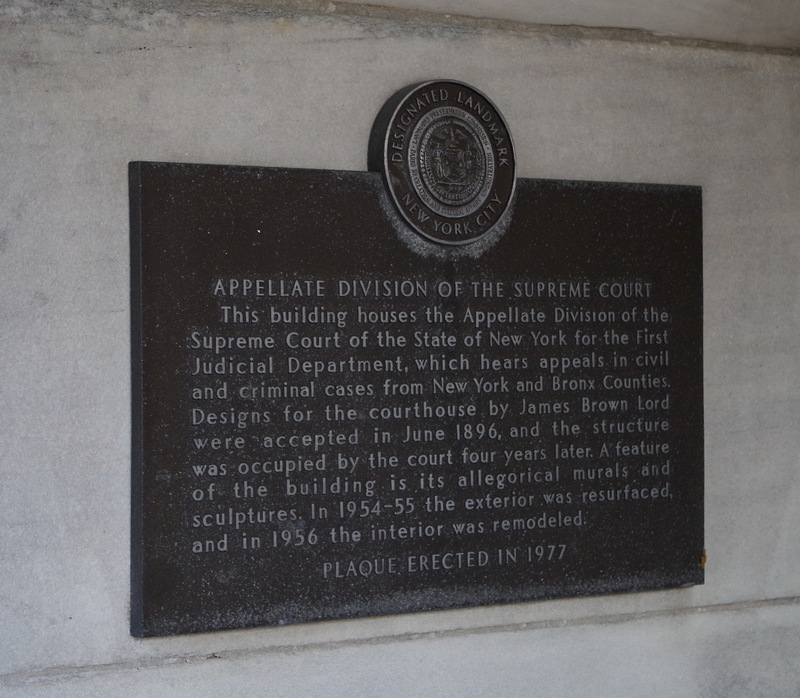 The building houses the First Department of the Appellate Division of the Supreme Court. The building was restored in 2000. The architect was Platt Byard Dovell White. Note: The cost of construction was $633,768. Ten artists were commissioned by James Brown Lord, with the assistance of the National Society of Mural Painters, to execute allegorical murals for the courthouse interior. 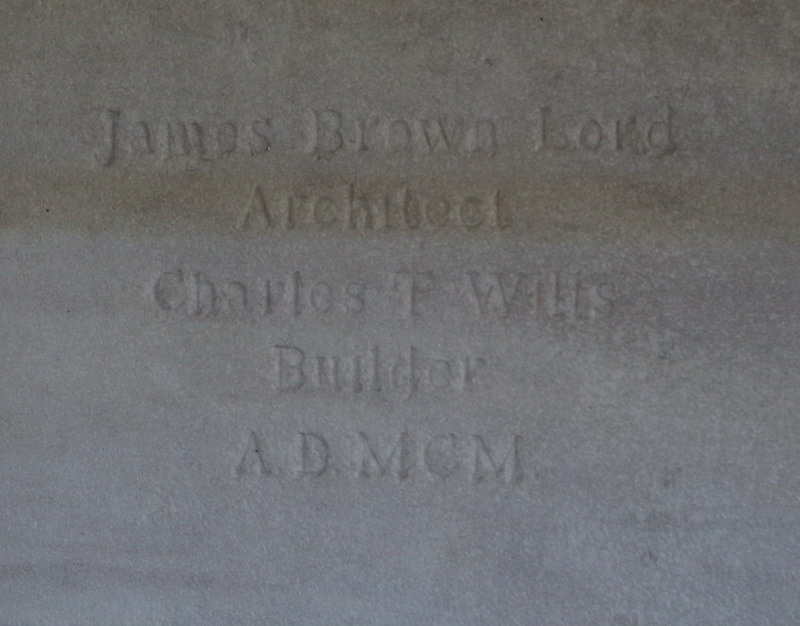 By spring 1898, Henry Siddons Mowbray ( Transmission of Law ), Robert Reid, Willard Leroy Metcalf and Charles Yardley Turner were selected for the murals in the entrance hall, while Edwin Howland Blashfield, Henry Oliver Walker ( Wisdom of the Law) , Edward Simmons ( Justice of the Law ), Kenyon Cox ( The Reign of Law ), Joseph Lauber ( Judicial Virtues ), and Alfred Collins were selected for the murals in the courtroom. Specially-designed furniture was made by Herter Brothers. 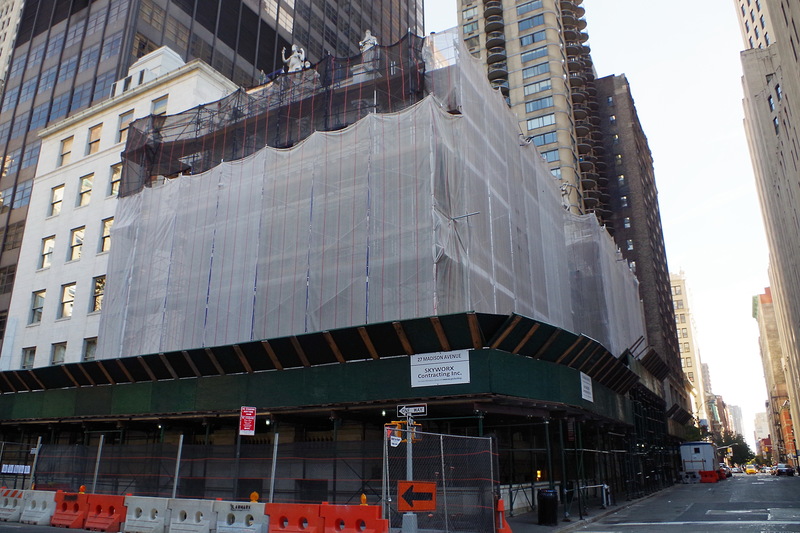 Note: Major exterior work is being undertaken. See: The building is located in New York County.